Over a twenty-five year period Lance Comfort was one of the most prolific directors working in Britain, but despite the initial impression of a successful career, he received scant critical attention during his lifetime and worked mostly at the margins of the industry. Born in Harrow in 1908, he entered the film industry around 1926 as an animator and cameraman on medical films. After several years in the camera department, he became a sound recordist at Stoll Studios in 1932. Then in 1934 he joined producer/director John Baxter 's UK Films as a technical supervisor. Over the next few years Baxter was to be a formative influence on Comfort and did much to foster his career. After directing a couple of documentaries and children's films, Comfort got the opportunity to direct his first feature, a piece of wartime propaganda, Penn Of Pennsylvania (1941). Unfortunately this was not the kind of subject Comfort warmed to and the result was a rather leaden bio-pic. By contrast, his next film, Hatter's Castle (1941), the darkly melodramatic story of a megalomaniac businessman who terrorises his family, provided him with exactly the kind of material he responded to. The dramatic focus is a group of self-interested, conscienceless individuals who are prepared to (and indeed relish) betraying and destroying anyone who gets in their way; while they meet the obligatory sticky end, the power of these characters is such that the nominal hero and heroine appear insipid in comparison. Through the '40s Comfort directed a series of quality dramas such as Bedelia (1946), Temptation Harbour (1947) and Daughter of Darkness (1948) with similarly amoral and tortured protagonists at their centre. 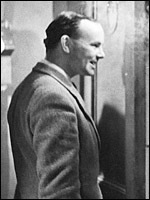 When the box-office failure of Portrait of Clare (1950) coincided with a major collapse of the UK film industry, work dried up, and he was only able to get back by agreeing to direct supporting programmes and some early television series such as Douglas Fairbanks Presents . Subsequently Comfort never managed to shake off the B feature label and climb back into the first division despite the obvious quality of films such as Tomorrow at Ten (1962). Nevertheless this quality, a consequence of his all-round technical competence, excellent organisation skills which allowed him to make the most of limited studio time, and an innate feel for film-making, ensured he remained busy almost up to his death in Worthing in 1966. Perhaps what kept Lance Comfort outside the mainstream industry was not a lack of ability but the bleakness of his own personal vision which is most clearly expressed in the melodramas and thrillers. The villains are more psychotic and subsidiary characters are more likely to be murdered than was the norm. Unlike his mentor John Baxter , his films steer clear of social messages; they are more concerned with the individual than with society, presenting a picture of mankind in which evil is not simply an occasional aberration but an integral part.